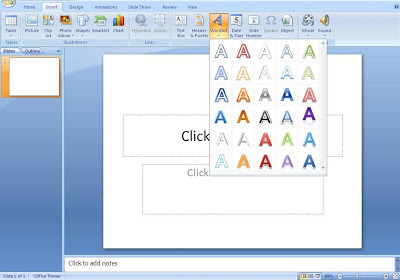 This tutorial for you that use Microsoft Powerpoint 2007. 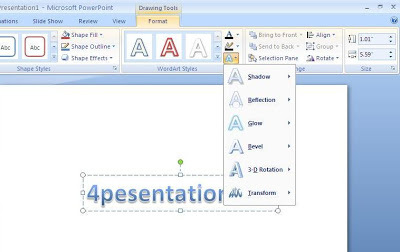 Open your PowerPoint Presentation. Now, we learn about Word Art style. What word Art?? 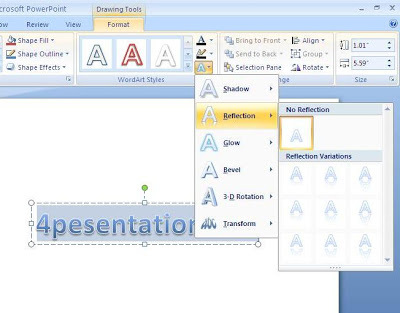 Word Art is a gallery text style that you can add to your 2007 Microsoft Powerpoint 2007 to create decorative effects, such as mirrored or shadowed text, 3D mode and more. How to Add Word Art ?? Click INSERT menu, select Word Art then you can choose style for your word. Then click. You will see “YOUR TEXT HERE”. You can also change the the style effect such as shadows, glow, reflections. Soft edges, bevels, and three-dimensional (3-D) rotations. Click at Format menu, select Text style. To change the style effect you must block all your text like the picture bellow. This tutorial will more beautifull if combined with animated image (read: Preloader and Ajaxload for your Powerpoint).